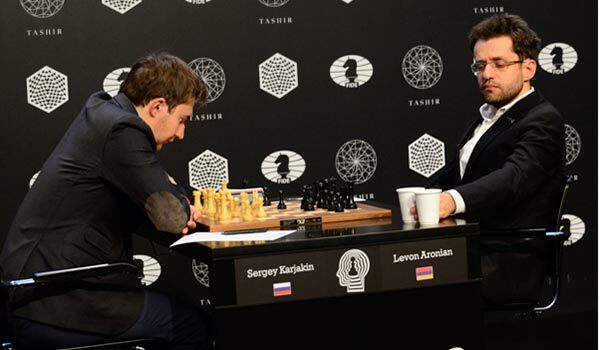 Top Armenian grandmaster Levon Aronian continues to hold a joint lead with Russian grandmaster Sergey Karjakin after eight rounds of play at a Candidates Tournament in Moscow, Russia. The two chess players played a tie in their Round 7 game on Saturday. The second stage of the tournament began on Sunday, with Aronian playing a draw against Dutch grandmaster Anish Giri. After eight rounds of play Karjakin and Aronian have 5 points each (the Russian GM has a higher tiebreaker score). Indian grandmaster Vishy Anand and Fabiano Caruana (USA/Italy) share third place with 4.5 points. There follow Giri (4), Russia’s Peter Svidler (3.5), American Hikaru Nakamura (3) and Bulgaria’s Veselin Topalov with 2 points. In Round 9 scheduled for Monday, Aronian plays against Anand with black pieces. The winner of the the double-round robin tournament will play a chess title match against reigning champion Magnus Carlsen (Norway) in New York, USA, on November 11-30.